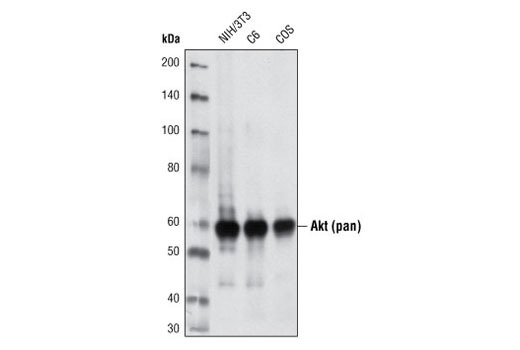 Western blot analysis of extracts from NIH/3T3, C6 and COS cells using Akt (pan) (40D4) Mouse mAb. 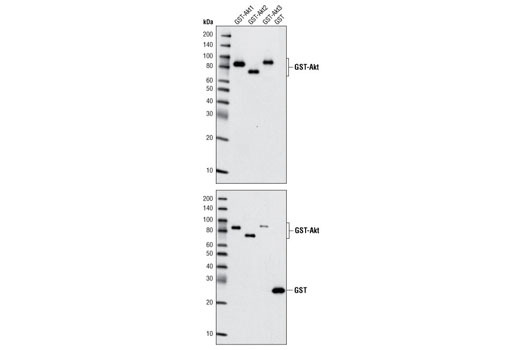 Western blot analysis of recombinant Akt1, Akt2, Akt3 and GST proteins using Akt (pan) (40D4) Mouse mAb (upper) and GST (91G1) Rabbit mAb #2625 (lower). 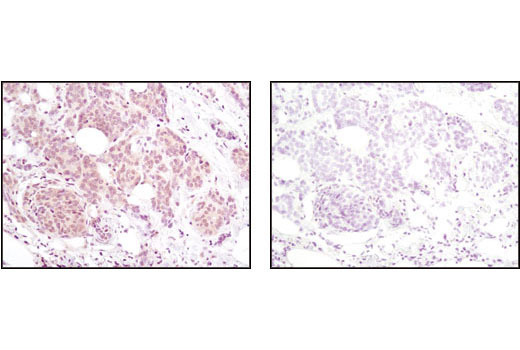 Immunohistochemical analysis of paraffin-embedded human breast carcinoma using Akt (pan) (40D4) Mouse mAb in the presence of control peptide (left) or Akt (pan) Blocking Peptide #1085 (right). 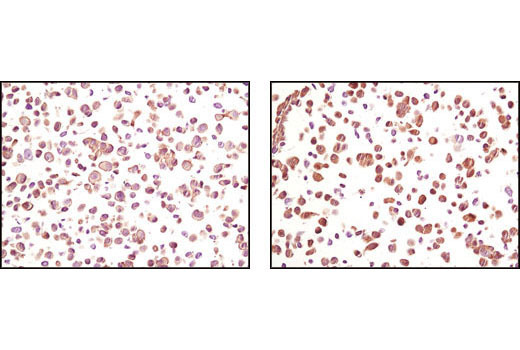 Immunohistochemical analysis using Akt (pan) (40D4) Mouse mAb on SignalSlide® Phospho-Akt (Ser473) IHC Controls #8101 (paraffin-embedded LNCaP cells, untreated (left) or LY294002-treated (right)). 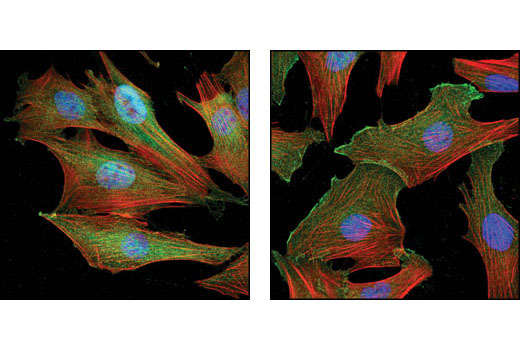 Confocal immunofluorescent analysis of C2C12 cells, either LY294002-treated (left) or insulin-treated (right), using pan-Akt (40D4) MmAb (green). Actin filaments have been labeled with DY554 phalloidin (red). Blue pseudocolor = DRAQ5™ (fluorescent DNA dye). Flow cytometric analysis of untreated Jurkat cells using Akt (pan) (40D4) Mouse mAb (blue) compared to a nonspecific negative control antibody (red). Detection System: SignalStain® Boost IHC Detection Reagents (HRP, Mouse #8125). Equilibrate SignalStain® Boost Detection Reagent (HRP, Mouse #8125) to room temperature. Cover section with 1–3 drops SignalStain® Boost Detection Reagent (HRP, Mouse #8125) as needed. Incubate in a humidified chamber for 30 min at room temperature. Blocking Buffer: (1X PBS / 5% normal serum / 0.3% Triton™ X-100): To prepare 10 ml, add 0.5 ml normal serum from the same species as the secondary antibody (e.g., Normal Goat Serum (#5425) to 9 ml 1X PBS) and mix well. While stirring, add 30 µl Triton™ X-100. 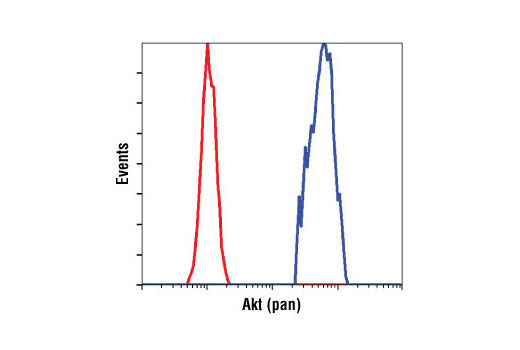 Akt (pan) (40D4) Mouse mAb detects endogenous levels of total Akt protein. This antibody does not cross-react with other related proteins. Monoclonal antibody is produced by immunizing animals with a synthetic peptide at the carboxy-terminal sequence of human Akt.